Senior Dog Wisdom is a veteriniarian – developed, cognitive support formula to maintain healthy brain function in aging pets. Older pets may exhibit signs of diminishing cognitive or mental function, such as confusion, disorientation, forgetfulness, and difficulty sleeping at night. 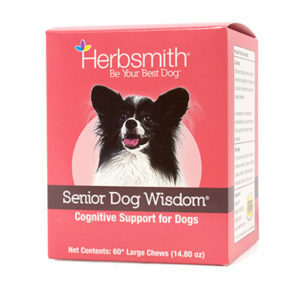 Senior Dog Wisdom supports healthy brain function. Cautions:Not for use in pregnant animals. Not for use within 48 hours of surgery or anesthesia.